Obama: Mother’s Day Should Celebrate Abortions-Fiction! - Truth or Fiction? Obama: Mother’s Day Should Celebrate Abortions-Fiction! President Obama has signed legislation that will mark “National Abortion Freedom Day” as a federal holiday that falls each year on Mother’s Day. 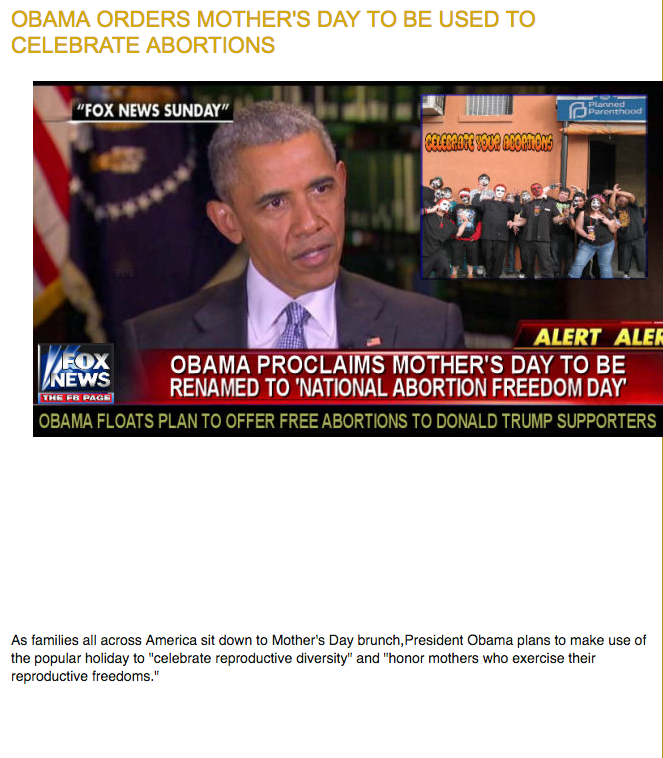 A fake news website is behind the hoax that President Obama has ordered that Mother’s Day be used to celebrate abortions. The story, which was published on Mother’s Day, was widely shared on social media. And, given their similar appearance, many readers were tricked into believing that the story came from FOX News, which it didn’t. Fox News the FB Page regularly targets Obama with false reports that are intended to draw strong reactions. The site has (falsely) reported that the president is making Cuba the 51st state, that he is making Kenya the 51st state and that he has called for a ban of the Tea Party’s flag.